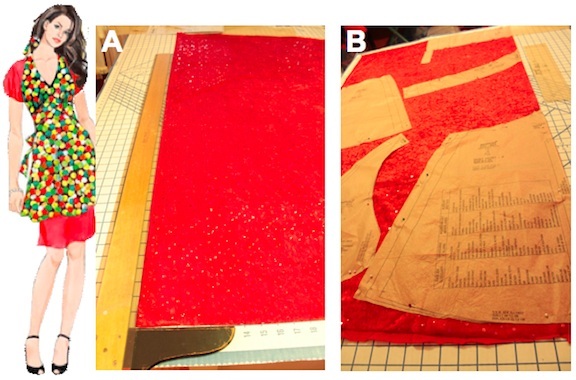 A) The fabric is laid out, and folded according to the pattern directions, or close. The selvage is lined up along the corner and along the tables edge, (or T-square). If not square, trim the CUT side (not selvage) until both sides are square and lines up to the tables edge, as in the photo above. Tools used here are either a T-square pictured here, or the edge of the cardboard table ($20). Two sides of most any table could be used in a pinch. B) In this photo you see that the fabric is folded over with WRONG sides together, and the fold is lined up according to the nearest straight line, so the fabric stays square. A ) Line up one end of the ruler on a set of straight parallel lines outside the fabric. 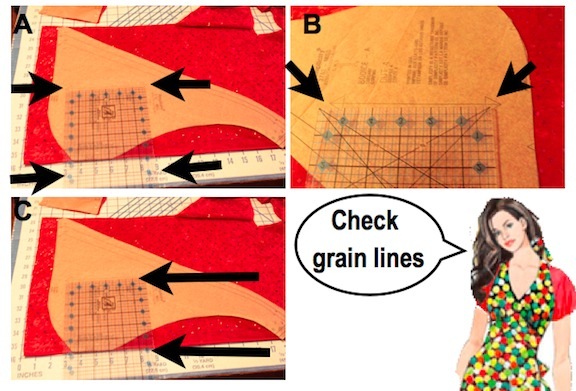 B) Find the grain line on the pattern. In exhibit B the ruler’s edge is lined up on the pattern grain line. C) Adjust pattern if necessary. When both ends line up, pin in place starting with a pin in the grain line. NOTE: Always minimize pin holes when possible. Line up the grain line on the pattern and the grain line on the fabric, parallel to the selvage.